We are a unique, historical hostel in an old school building on the islands of Suomenlinna sea fortress -a Unesco world heritage site. Suomenlinna is a village-like neighborhood of 850 inhabitants next to Helsinki's downtown. If you are looking for a more peaceful and idyllic environment to stay, but still within easy reach from the city center, Hostel Suomenlinna and Suomenlinna islands are an excellent choice for you! Hostel Suomenlinna is a friendly, laid back hostel with a charming archipelago nature around it. We have welcomed travellers from all around the world as a hostel, a youth camp center and a meeting point for groups since 2002. 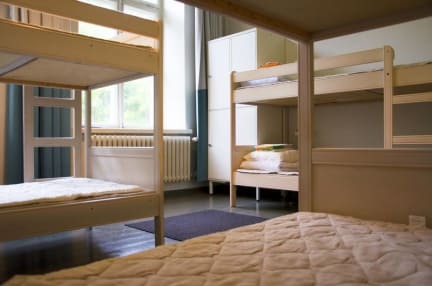 Our Hostel is run by the non profitable Finnish Camp School Association. Hostel has all together eight rooms and 39 beds on two floors. Rooms are for 2-10 people. There are three dorm types available (downstairs, 3 rooms) - 7 beds(mixed), 8 beds(female dorm) and 10 beds(mixed). Hostel has four private room types available (upstrairs and downstairs, total 5 rooms): double, twin, triple and quadruble. Extra beds available. Dorm rooms come with comfortable solid bunk beds and a locker per bed. Rooms are spacious with high ceilings (4 m). 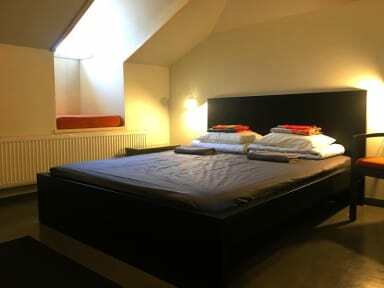 douple, twin and triple rooms come with single beds and have charming attic style ambiance. Toilets and showers (24 h hot water) are in the corridor on both floors. Bed linen and towel are provided in private rooms. Reading lights in all rooms. Heating system in all rooms for the winter time and double windows. No air-conditioning. It is a wonderful hostel and the staff is very kind and helpful. Very clean hostel with a unique location on Suomenlinna island. The experience is unbeatable for a summer trip to Helsinki. It is only 12-15 minutes by boat to the market square of Helsinki, and it takes less than a minute to walk from the hostel to ferry. There is also a K Market grocery store at the end of the street. Staying here allows you to get up and explore the fortress and surroundings before all the other tourists arrive. Had a relaxing stay here, and would come back. Located in a beautiful old building with heigh ceilings and dimly lit corridors - this hostel was perfect for a one night stay. Quiet, clean and situated a 2 minute walk from the ferry. Suomenlinna itself is breath-taking - and I'm so glad I accidentally booked a night on the island! The hostel serves it's function to give you a bed and a shower. But generally it was one of the worse hostel I have visited. Was there on new year eve and it was quiet not one person in a living room. the location is good to the ferry. but the atmosphere there feels a bit scary. Boring hostel, far away from the city centre. I wouldn't bother going back. I guess if your looking for something quiet with good facilities then it would be good. It's quite an expensive stay, but one has to bear in mind that you must also purchase ferry tickets every time you want to go to the mainland. The island is quite nice and worth seeing, but a pain to be based at. We weren't really shown the facilities nor told the code to get into the building, it was sheer luck that someone was leaving as we wanted to get in. I was also irritated that our beds were not made.